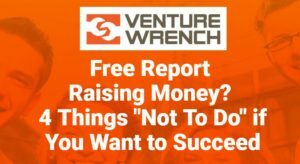 If you would like to join our VentureWrench Startup Community of success-oriented entrepreneurs, please enter your email in the form below (scroll to see the “Join the Community” button!). You’ll get our free report! Members of the community will receive updates, links to useful resources, entrepreneurship highlights, opportunities for training and other information to help your success, via email. It’s easy for an entrepreneur to make mistakes that can kill your chance of raising money from investors, perhaps killing your startup! Don’t Make These Fundraising Mistakes! Get this FREE report of 4 things not to do! ♦ How your startup financials are a compelling lie! ♦ Is a potential investor milking you for competitive intelligence? ♦ Why meeting with the wrong investor can be worse than not meeting with them at all. You can unsubscribe from our VentureWrench Content at any time by clicking the link in the footer of our emails. We use GetResponse as our marketing platform. By clicking above to receive your free information, you acknowledge that your information will be transferred to GetResponse for processing under GDPR regulations.